After missing the finals in 2016 and with the knives out for Damien Hardwick, Richmond completed the ultimate fairytale making a stunning turn-around to capture the 2017 flag. Here are five talking points from todays action. The old adage goes that it is easier to destroy than create and this held true today. The league’s best defence went up against the best attack. The Tigers game-plan stood up better on the biggest day of all. The had numbers to the contest, stuck their tackles and most importantly stopped Adelaide playing their efficient gamestyle. One of the hallmarks of Adelaide’s play during the season and finals was the use of short kicks when coming out of the 50 when the opposition defence is setting up or set. The Tigers did a tremendous job of organising themselves to set up their defensive structures. Short kicks were at a premium, clear cut switching was impossible and the Crows were repeatedly forced into kicking down the line. Any time they did force the issue – the Richmond pressure forced crucial turnovers. There was precious little run and carry and again credit goes to the Richmond pressure (perceived or otherwise) that limited this. Alex Rance was a colossus as always – repelling attacks and never putting a foot wrong. His ability to read the play, intercept mark and always take the right option is the reason that he is the best defender in the game. But his ability to play that role is hugely assisted by the versatility and ability of David Astbury, and Dylan Grimes to a lesser extent. On this occasion – Astbury took on Taylor Walker and did a fantastic job. Astbury’s job was made a bit easier by Richmond’s midfield pressure decreasing the quality of delivery to Walker and he also enjoyed great support from VLaustin and Co. but his efforts played crucial role in the Tigers victory. There were so many names here it is hard to pick two. With Nankervis the only ruckmen and no one else capable of pinch hitting in the ruck – Shaun Griggs was tasked with facing up to big Sam Jacobs during a pivotal 5-10 minute period in the second quarter. Griggs got dominated in the taps but with Richmond adding an extra midfielder to the contest and with some good work by the midfielders sharking several taps – Richmond survived this period without any scoreboard damage being done before Nankervis returned to take over. Townsend is a great story entering the seniors after showing great form in the VFL. He played another great role by stopping the run of Lever, competing in the air and getting on the scoreboard. He kicked accurately and his pressure justified his late but timely inclusion into this Richmond team. Jack Riewoldt’s value to the team is immense. 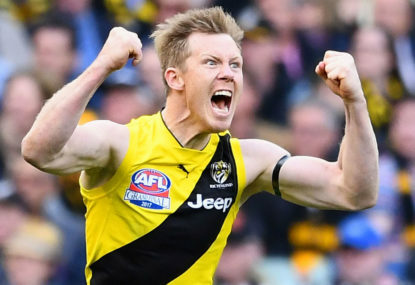 He is much maligned in certain quarters but I doubt Richmond would be here without his selfless play during the season. His job is simple – get to as many contests as possible, bring the ball to ground and provide ground pressure when defending. He did all that and more leading from the front and being the best key position forward on the ground. He took several towering marks, laid tackles and could have had a few more goals if he had kicked more accurately. It was a good effort by the men in white (or yellow) and they deserve credit for the manner in which they umpired the game. Common sense prevailed and it is hard to think of a decision they got wrong. They were clear in their explanations and even when at first sight it seemed a wrong decision – the replays almost always supported their decision. There were no silly deliberate out of bounds given and the head was protected well.